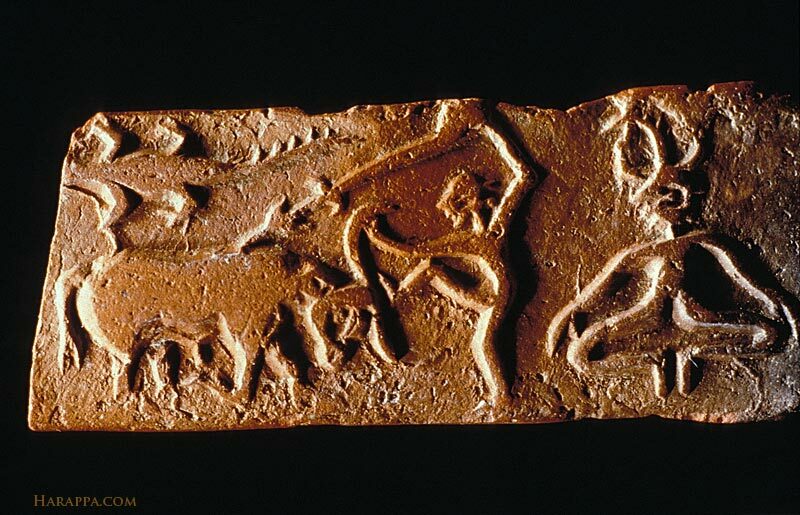 Plano convex molded tablet showing an individual spearing a water buffalo with one foot pressing the head down and one arm holding the tip of a horn. A gharial is depicted above the sacrifice scene and a figure seated in yogic position, wearing a horned headdress, looks on. The horned headdress has a branch with three prongs or leaves emerging from the center. On the reverse (90),a female deity is battling two tigers and standing above an elephant. A single Indus script depicting a spoked wheel is above the head of the deity.